The term drone is thrown around in a haphazard manner these days. Originally, drone referred to an unmanned aircraft preprogrammed with a flight plan, in which the aircraft would fly in either a straight line or around in circles until the engine would run low on fuel, and then the drone would land. Keep in mind that these are civilian terms, and many more complex terms are used by different government agencies. Even agencies such as the U.S. Army and Air Force do not agree on the same technical jargon. The quadrotor and octorotor drones are the most common of all the RPAs. Not all RPAs look like a modern take on the helicopter nor do all UAVs look like airplanes. Aerial drones have become a hodgepodge of both. The main thing to remember is that RPAs are being controlled in “real-time” by a human and UAVs are not. There are many types of uses for aerial drones. Whether military or commercial, the applications are similar in nature. As technology progresses, the types of drones available will be endless; imagine a world in which everyone rides around in driverless cars, or a micro-drone brings you a perfectly made cup of coffee. Attack drones — Used only by the military, these drones are equipped with lethal weapons and used for controlled air strikes in hostel or inaccessible areas. Crowd control drones — Equipped with non-lethal weapons such as tear gas or sound cannons, these drones are used to break up large, out-of-control crowds of people without causing any substantial physical harm. Typically used by the military and law enforcement. Delivery drones — Originally developed for the military to deliver goods to ground troops, these drones are equipped with a claw or similar delivery system and are able to remotely drop items or gently place items in a desired target area. Some big shipping companies like DHL and Amazon are starting to implement these types of deliveries to minimize shipping times, overhead costs, and dangerous driving conditions. Monitoring drones — Equipped with both standard and infrared cameras as well as sensitive weather instrumentation, these drones are used to monitor a variety of areas. For example, drones equipped with these cameras and instruments are used to help prevent street crimes or aid in the detection and prevention of forest fires. These drones are also used for reconnaissance missions as well as other military applications. Photography/videography drones — These drones are becoming more popular in the art world. Prior to drone technology, aerial photos and videos had to be taken from an airplane or helicopter, and this process was very expensive. Now that commercial drones have become available, photographers and videographers of all kinds can get those stunning shots without the big budget. The variety of drones available for sale is still very limited; a few brands of commercial drones, like Parrot, are dominating the market. Depending on the capabilities of the drone, consumer drones can range from $200 to thousands and thousands of dollars. How is the drone controlled? Some drones are controlled with an app on your tablet or touchscreen computer while others are controlled by a remote control similar to one designed for a video game console. How far can the drone fly before losing signal from the controller? While the cheaper model drones can reach 1000 feet or so from the person controlling the device, some more robust and more expensive models use cell phone towers or satellite signals and have a lot larger range of freedom. What do you want to use your drone for? 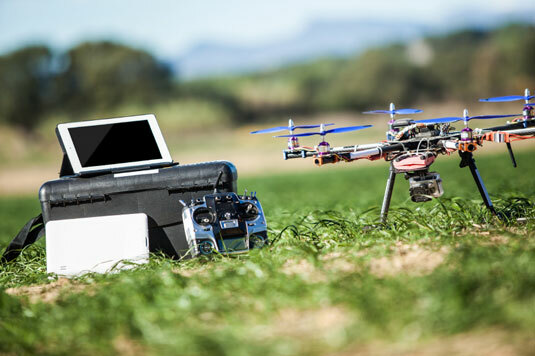 Chances are, as a consumer, you are looking for a photography drone or toy drone for just the joy of flying the device, but if you plan on using your drone for a practical application (like to help with farm work), be aware that there are several different types of drones to choose from and make your choice based on the practicality of your needs. How long can the drone fly until it needs to refuel? Originally, drones were designed with an internal combustion engine inside, but due to power output requirements and distance limitations (not to mention lots of extra weight and noise), drones have adapted to lithium ion battery powered electric motors. The time a drone can stay aloft is mostly determined by its battery size, power output, and price range; some only lasting minutes while others can stay in the air for more than an hour. As more and more drones become available to consumers and regular sightings of the UFO-esque devices flying around increase, expect prices to drop, and more variety to hit the market.